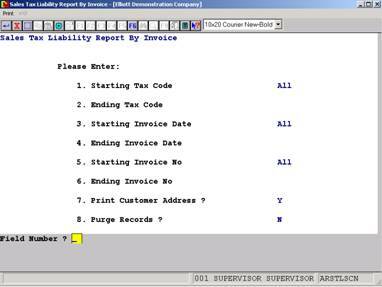 Sales Tax Liability Reports are a function of the A/R Sales Tax Audit Trail feature. The purpose of this feature is to give a detailed tracking for sales tax so that complete auditing information can be available (especially for state auditing). 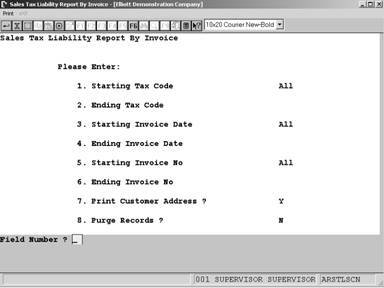 This feature enables users to create Sales Tax Liability Reports for each tax code based on invoices. To run these reports, the A/R Sales Tax Audit Trail feature must be enabled, see Utilities Set Setup – A/R Sales Tax Audit Trail . In order to get a glance of how much sales tax the user needs to pay to each state, county, and city, two reports are available to the user. One is Sales Tax Liability By Invoice, and the other is Sales Tax Liability By Cash Receipts. They both can be accessed by going through A/R à Reports à Sales Tax Liability Report. The figures below display the print screens of each kind. The report by invoice is asking the user to enter starting and ending Invoice Dates versus Cash Receipts Dates in the report by cash receipts. The report by cash receipt has an additional field - 8. “Print Full-Receipt Invoice Only?”. The first screen below displays the Sales Tax Liability Report by Cash Receipts. The “Receipt-Amt” and “Adj-Tax-Amt” columns will only display if the report is by Cash Receipts. As you can see, the report by Invoice does not contain these two columns (see the second screen below). 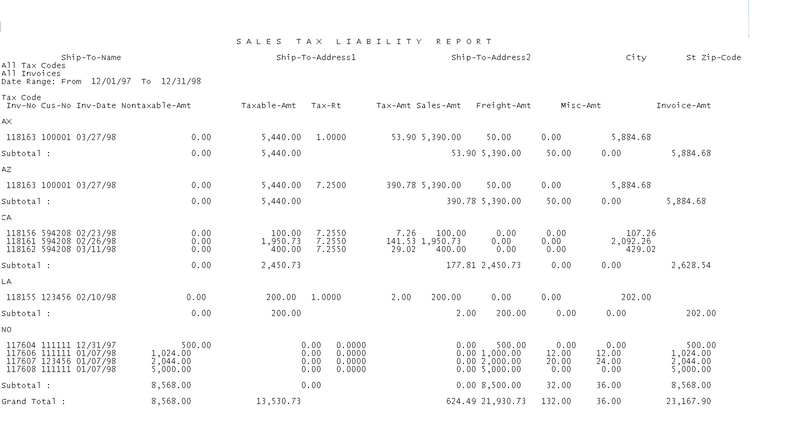 Printing screen for Sales Tax Liability Report by Invoice.